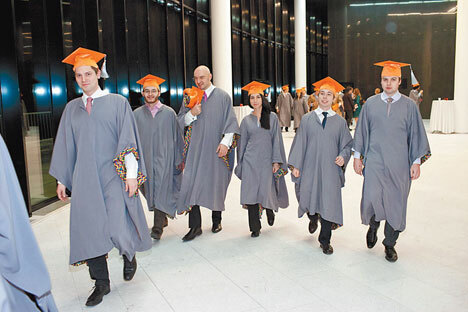 Business class: graduates from the prestigious Moscow School of Management at Skolkovo. Source: Press Photo. Many Russian schools now offer high-quality MBAs. But the legacy of the chaotic Nineties means they aren’t always recognized abroad. Business education did not exist in the Soviet Union, and is a relatively recent phenomenon in Russia. It got off to a chaotic start when a wave of business activity swept the country in the first half of the Nineties. Most of it was only nominally legal – business schools were operating without proper licences, inviting clients to shell out between $20,000 and $30,000 to complete a full “Harvard” course in a couple of months in exchange for a certificate resembling those issued by the famous American university. Many consumers paid for these bogus degrees. Federal universities were the only institutions that tried to piece together world-class programmes as those working in them were interested in improving academic standards rather than just making a quick buck. By the start of the new millennium, Russian consumers had become more discerning, especially after the 1998 crisis. Those in the business education market had to adapt to survive: few succeeded. The top providers of business education in Russia are schools affiliated with universities. Those that are part of Moscow State University, St Petersburg State University and the Academy of National Economy, hold almost half of the market between them. Skolkovo, which has positioned itself as an elite school, stands apart from the rest. In total, there are around 80 licensed schools. Tuition fees vary: from $60,000 at the largest business schools to $90,000 for a course at Skolkovo. However, small uncredited schools charge only $5,000-$10,000 for less reputable courses. The world’s best schools offer three certificates, issued by the American, European and British business associations. No business school in Russia can currently offer all three international-quality education certificates. Russia doesn’t have any US-licensed schools, but 12 schools hold British licences and the Graduate School of Management of St Petersburg University is about to obtain a European licence – the first in the country. This, according to the schools’ directors, has mostly to do with the specifics of the country: it doesn’t make sense to introduce some standards accepted in the West, either because of local business peculiarities, or because of the mentality of Russian managers. Around 10,000 people receive a business education in Russia every year. As in other countries, most MBA students (78 percent) are mid- or senior-level managers. The Russian MBA League says half are there because they believe it will help advance their careers; 45 percent hope they will be able to do their jobs better and 5 percent want to start their own businesses. In developed countries, most MBAs are funded by employers but in Russia 80 percent of students pay for them. Many students ask their school not to tell their employer they are taking the course as they are often studying to help them change jobs. They often treat the cost of an MBA as an investment and want to know when and how it will pay. Lecturers say there is never a definitive answer to that question. “It makes sense to get a business education if you’re already a manager; it’s a waste of money if you are working in a low-level position,” says Sergei Myasoyedov, chairman of the Russian Association of Business Education. The main goal of MBA providers, he says, is to help people solve management problems at work. A classic situation is where a talented engineer is promoted to vice-president and faces the challenges of managing operations, human resources and strategic planning. Schools nevertheless continue to keep statistical records. According to the Russian MBA League and the Superjob.ru web portal, 40 percent of business school graduates are promoted within two to five years of graduation. This number reaches 60 percent for specialists and mid-level managers; those promoted see their income rise by 50 percent. Russian MBAs differ very little from those in Europe or the US in terms of curriculum, duration and costs. Although standards vary greatly between schools, the top Russian institutions can provide an education on a par with good European competitors. Yet Russian business education credentials have historically been met with caution abroad. Recruitment experts mostly attribute this to the legacy of the Nineties. “A large number of ‘fake’ schools discredited Russian education at the end of the last century, and that’s why many international companies are still wary of Russian MBA degrees,” an expert at HeadHunter recruitment firm said. He believes it will take another 10 years to overcome this stereotype. However, those schools with joint licensed programmes with European institutions can issue two diplomas to their graduates, their own and that of their partner school.